For 70 years now the military and economic partnership between the United States and Western Europe has produced unparalleled peace and prosperity. Now a growing rift threatens that alliance, and many question whether it can or should survive. Where will this divide lead? That was his estimate of what Germany agreed to contribute to its own defense under a North Atlantic Treaty Organization arrangement versus what it actually spent over the past 14 years. Since then, Mrs. Merkel has issued her own barbs that Europe can no longer count on the United States and must take matters into its own hands. 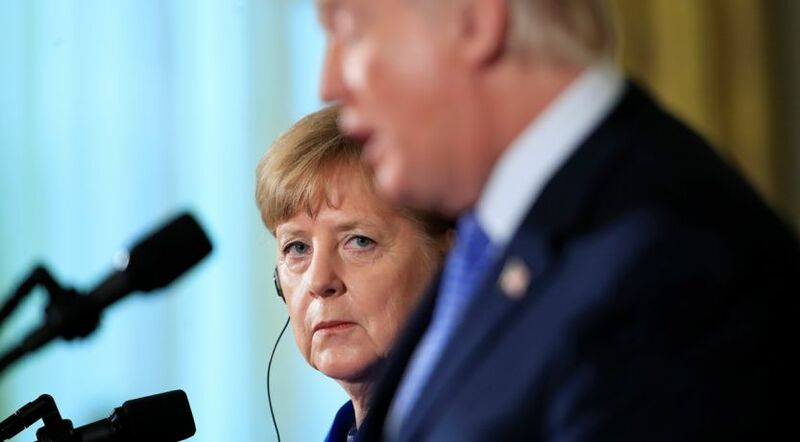 The divide between these two leaders has often been painfully visible, as Mr. Trump has made the German chancellor one of his favorite rhetorical targets, often assailing Germany’s anemic defense, trade and migrant policies. At the NATO summit in July the president raised the level of contention, shellacking Germany for being “totally controlled by Russia” because of its dependence on the Kremlin’s monopoly on energy. Because nearly one-third of the global trade in goods occurs between the EU and the United States, a transatlantic rift morphing into a trade war would have enormous impact. U.S.-EU trade totaled nearly $1.1 trillion in 2016, with the U.S. running a trade deficit with the EU of $92 billion that year. This is not the first time the U.S.-Europe bond has been tested. The Suez Crisis of 1956, when President Dwight Eisenhower had a tense standoff with Britain and France over control of the Suez Canal, tried the relationship. The 1980s saw President Ronald Reagan’s planned deployment of midrange nuclear missiles to Europe trigger an eruption of protests and division. And the Iraq War in 2003 stirred deep anti-American sentiment on the continent. But as Nicholas Burns, a career diplomat who served in the George W. Bush administration, noted in The Wall Street Journal, “In each of those three crises, neither side felt that either one was abandoning the West, abandoning the basic contract that we’re allies” (quoted by Gerald Seib). The divergence between American and European policy now, however, is occurring much more often and with increasing emotion. Less than two years into his presidency Mr. Trump has brazenly disrupted the status quo, pulling out of the Paris climate agreement, recognizing Jerusalem as Israel’s capital, withdrawing from the Iran nuclear deal and placing tariffs on European aluminum and steel. European media took a strident stand against President Trump even before his election. According to a recent Harvard Kennedy School study of global media, 98 percent of German public television news portrays him negatively, making it by far the most anti-Trump media in the world. Not surprisingly, according to Pew Research, a majority of Germans—compared to a small minority of Americans—believe the U.S.-German relationship is “bad.” Another recent poll found that only 14 percent of Germans believe the United States is a reliable partner. Many Germans feel this way because Washington has developed an exasperating habit of making unilateral diplomatic decisions that have a disproportionately negative impact on European businesses. Many Europeans, furthermore, believe the post–World War II, U.S.-led order is in rapid decline. Pluralities of those Pew surveyed last year in France, Germany and Britain said that China—not America—is the world’s leading economic power. Not popular in Europe, but why? “He doesn’t believe,” continues Mead, “military power will become less relevant as progress marches on,” and he believes individual nation states will remain the dominant geopolitical force. Mr. Trump concludes, according to Mead, that “the EU’s political establishment is just as blind and misguided as they believe he is” (Wall Street Journal). As a businessman and self-proclaimed dealmaker who sees international relations from a transactional perspective demanding reciprocity, President Trump despises Berlin’s trade imbalance with Washington. Like many Western nations, Germany has grown accustomed in the nearly three decades after the Cold War to slashing defense budgets, enjoying its “peace dividend” and outsourcing its defense under the U.S. security umbrella. In one sense, President Trump is proving to be a unifier of an increasingly anti-American Europe that is feeling more confident in its ability to reject any partnership with the U.S. As the biggest economy in Europe and fourth largest in the world, Germany has an astounding current account surplus amounting to 8 percent of its gross domestic product, but puts only 1.24 percent of that GDP toward its own defense—far below NATO’s agreed-upon minimum contribution of 2 percent. The German electorate, which associates military strength with the country’s darkest chapters, currently balks at increasing military expenditures. Neighboring countries, though, these days seem to be concerned less by German strength than weakness. Germany has cut its armed forces from around 500,000 soldiers in 1990 to around 180,000 in 2017. Meanwhile, equipment rusts and grows outdated. Entire areas of the military are “hollow,” short on everything from tents to winter clothes. Recent military assessments noted that because of needed repairs, less than half of German tanks are battle-ready and that none of their six submarines are seaworthy. The German air force lends little to NATO, as only four of the Luftwaffe’s 128 Eurofighter jets are armed and ready. During a recent assessment, a paltry 8 percent of German soldiers trusted their weapons, and in 2015, due to poor funding, soldiers were forced to use broomsticks as guns during training exercises. Repercussions of a transatlantic rift are massive. The imbalance of the trade and military partnership highlighted by the American president threatens to turn the rift into a rupture. In one sense, President Trump is proving to be a unifier of an increasingly anti-American Europe that is feeling more confident in its ability to reject any partnership with the U.S.
As the EU intensifies its economic relationship with Russia through massive energy deals and pivots toward Asia, the gap will widen. The object of NATO, said General Lord Ismay, its first secretary general, was “to keep the Russians out, the Americans in, and the Germans down.” President Trump’s threat to walk away from the alliance if there is not more burden sharing potentially changes the formula. But requiring Germany to step up may, down the road, lead to a far different result than anticipated. As economic tensions rise, consider that end-time Bible prophecy foretells a revival, led by Germany, of a 10-nation “beast” power to rise again from the ashes of the Roman Empire (Revelation 17:9-14) as an awesome and unmatched military, economic and religious power (Daniel 11:40-45; Revelation 13:1-8; 18:2-3, 9-14). Watch for it, and learn more about the future for Europe and the world in our free booklet The Book of Revelation: The Storm Before the Calm.